Roll wth Rhod are a fully approved DVSA registered driving school, run by Rhod Pugh. 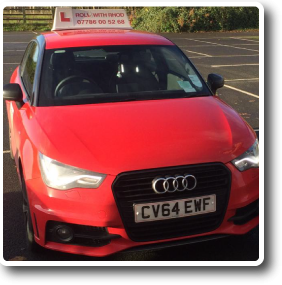 Rhod is a fully qualified Driving Instructor, operating mainly in Cowbridge and Bridgend. Here at Rollwithrhod.co.uk, you can check out our services, read what our previous students think about us on our testimonials page, and practice your theory. Feel free to browse through our extensive gallery and check out our success rate with photos of our first time passers! If you have any questions: you can tweet us or reach out on Facebook, email us or just pick up your phone and give us a call the old fashioned way.